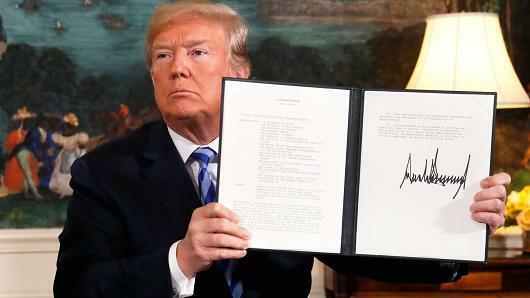 One day after Trump announced he will withdraw the US from Obama's landmark 2015 deal to curb Iran’s nuclear program while reinstating the "harshest of sanctions" on the Persian Gulf country, and giving US allies 180 days to extricate themselves from Iranian oil deals as it seeks to economically isolate and curb oil exports from the #3 OPEC producer, this is how the world and capital markets are reacting. This following summary, prepared by Bloomberg, includes reactions from governments and companies in Europe and Asia, market impact and views from analysts. Poland’s Lotos says Trump decision on Iran is “neutral” for co.